I feel I should let you know a few things before you read this review. First, I am a HUGE Marquita Valentine fan. If she wrote it, I’m gonna read it. Second, I received a free copy of this book from NetGalley for an unbiased review. Third, THIS BOOK IS LIVE TODAY!!!! So about the story. Colin and his siblings were banished from their island nation when Mom and Dad—Queen & King—were assassinated. They fled to the family home in North Carolina where he meets Della, a feisty southern girl with a big ol’ heart. Della and Colin become fast friends. She helps with the kids and his siblings and eventually feelings develop. Obviously there’s a lot more to the story but read it and you’ll find out! 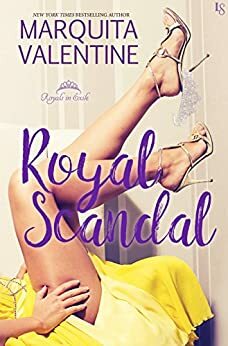 I really enjoyed Royal Scandal. It made me think of the Holland Springs series in the way it was fun and funny, quick witted and so damn swoonworthy you just can’t stop reading it. I mean I almost always love her stuff but THIS is why I love Marquita. This was one of my favorite tropes, friends to lovers but these guys were real friends. Down for whatever you need friends, yes even marriage when I find out you’re a secret prince kind of friends. I love that about Colin and Della and I loved that she wasn’t afraid to be herself around him. If he needed to be told off, Della told him. If Theo was being a baby, she told him. When the twins needed a hug, she was there. Colin was…sigh. I loved that he got all stiff and formal when what he was saying was really important. He had to get it just right and seriously it was so adorable even I wanted to wrap my arms around him and squeeze. Was there anything I didn’t like? Honestly I didn’t love the last chapter with Charlotte but I guess its just because I wasn’t all that invested in her. With that being said, I’m totally getting the next book as soon as I can get my hands on it!